I have finally beat Heroes of Might and Magic VI, and it could not come a moment to soon. By the end of the day tomorrow, I will own XCOM: Enemy within, and will be playing that whenever my daughter does not need attention. The game has two endings, corresponding with the two reputation paths that every hero can take: Blood and Tears. The Blood ending has you chasing down the faceless, and the Tears ending has you confronting the angels. You can only play each with heroes that followed the corresponding reputation path. The endings seem a little mixed up, as the faceless are considered evil, and the Angels good, but the blood reputation is the less noble, offensive choice that ends up going after the evil guys, with the noble, defensive path assaulting the angles. The first ending I tackled was the Blood ending, because I really wanted to play my super-powered Necromancer Nerina again. I knew I had gone out of my way to make her personally powerful in ways that I just didn’t have the tolerance for in later campaigns. It turns out, and I never bothered to research and had to have a friend tell me, that the Hero lends a portion of their personal power to each of their units. Nerina had so much Magic Power at the end that the Liches, Fatespinners and Specters were doing massive amounts of damage. This lead to the actual map, in which you fight each faction in succession except for Inferno, pretty simple. I took massive stacks of Liches and Fatespinners and just launched a massive magical fusillade at enemy until they crumpled. It was stupendously glorious. Sanctuary was first, and went down swiftly, followed by Stronghold, Haven and then Necropolis. The final battle had Cate, your mother and Dragon Knight of the Faceless, Turn into a giant dragon (she may have summoned it, to be honest, it wasn’t very clear.) I sent everything I had at her, doing a significant portion of her heath with most of my army. The final unit to act was the champion unit, Fatespinners, who critically hit, doing over 1/3 of her hp in a single blow. The Fatespinners acted at the start of the next round and crit again, putting away the Shadow Dragon once and for all. It tool me, all told. 1 round and 1 action to drop her. I was exalted because I’d actually blasted her off the planet so fast it wasn’t funny. The Tears campaign was a completely opposite type of campaign that I happened to pick the right faction. You fight against Haven the whole time, and you have almost no resources (mines, crystals, lumbermills) other than what the neutral mobs hold. This causes you to fight a strange war where you don’t ever really fight the enemy faction, you just spend the time running around blowing up hapless neutrals to get their resources and gold, which you then convert to resources. Thankfully I picked Haven as my faction, mostly because the only other faction I could play in this one was my Sanctuary Magic hero, and I had just done that.Haven, however, allowed me to just occupy the opponents towns and forts and use them immediately. I have no idea how I would have made it if I was playing a faction that, using the limited resources of the map, had to constantly spend them not to advance my faction, but to convert the enemy forts I captured to some form of usable condition. With the goal being to take and hold a single fort, haven was singularly capable with their defensive oriented suite of abilities, along with the might abilities that I had taken. The whole of the map was confusing, without really any way to know what was going on. However, in the end, you get to mangle the Archangel Michael, and it is very satisfying to beat his smug face into the earth. Between the two, I found the Tears/Faceless battle much more satisfying. Honestly The blood and tears path concept was really intriguing the first campaign I played, but after that felt unassumingly boring. The main method you get blood points for casting offensive spells and other direct-damage related abilities. You can also get them from choosing power over defense in the Libraries (Magic) and Arenas (Might), and sometimes from quests. The final way of getting blood points was in pursuing enemies that fled. This is extremely tiresome, as each fight has the capacity to take a significant amount of time, deplete your mana and your units if played wrong, and waste map-based buffs that you keep until your next combat. This proved to be extra frustrating because every time you choose not to pursue them, you gained tears points, which is very counterproductive. Tears points are gained in the exact opposite manner as Blood: Casting defensive spells and abilities, Choosing defensive bonus’ at Libraries and Arenas, and from letting fleeing monsters live. This would be a great boon, except that almost all of the good Tears abilities are passives, and most of the spells were terrible. This lead to a stagnation of reputation points and conflicted gains. I was very disappointed with this part of the game, to say the least. Overall, however, The game was a fun play. I really wish I had known more about how to play the game before I started, as it would have made the game much more playable. I really wish, as well, that there was a resource for the game as a whole, as I’ve not found a single site that is even remotely useful to the theory and play of the game. I’d give it a solid 7 out of 10. There are some problems, I’m not going to lie, but overall, its been what I wanted from it, though a bit longer and drawn out than I would have liked. XCOM, Enemy within is downloaded and ready to play when I get home! We're with you, to the Death! So, a while back I posted that I had acquired a box of Bane Knights from a friend, and that he’d gotten the better end of the deal. Once I started cleaning the bits and getting them ready for general assembly, I decided that I wanted to do a shield swap. Not really knowing where to start, I headed over to the Privateer Modeling and Painting forums, and asked them what was out there. I got some really cool options, but what really struck me was Scibor Miniatures spartan shields. With my degree in classic history, how could I resist! Now, armed with a shield swap out, I was emboldened. What else was out there? I found, again on Scibors site, Spartan helms. Sure they had heads inside, but I could drill them out, right? I could make them work. Now I was in a bind. I had spartan shields and spartan helms, but the bane lances of the bane knights didn’t fit the theme at all. I needed a good, solid, no frills, spartan spear. They seemed perfect! I only had 8 of them, but how hard could it be to get more? I’ve got a post out there on bartertown now with a pair of leads, so here is hoping! Now I’ve got everything: Spears, Helms and Shields. Time to get to work! 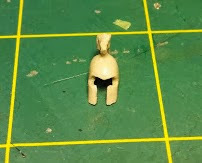 I had to drill out the helms, which was easier than I thought it’d be, but still no simple task. The Scibor resin is extremely soft and I would have been disappointed with it in any other circumstances but having the soft material was useful, as it allowed me to cut the helmet down fairly easily. 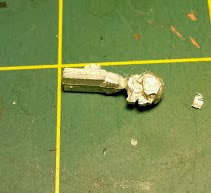 Once the hole was drilled, I carefully cut out the face using my hobby knife. 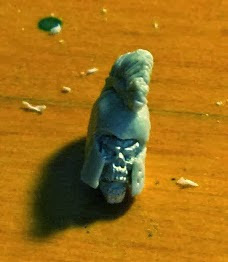 I then shaved as much as I could out of the helmet, making it as thin as I could, so as to fit on the bane knight heads. Grabbing one of the Bane Knight skull faces, I tried to stuff it in there. The head was too big. I was a little stuck, but like any good, determined nut job, I went with plan B: cut the face off. I’d expected something like this, though not as extreme, and figured out the basics of what I wanted. Cutting the face off was difficult, no lie, but nothing I couldn’t do. Well, except that once face that I had the clippers on backwards, and the face completely shredded. Sadly, even the face clipped off was to large. I ended clipping the forehead off, both cheekbones, and even some of the eye socket. Whatever it took to get the face to fit in that head. Thankfully, I never needed to take away any of the defining characteristics that made it a face. I had the face all cut and ready to go, and I shoved it into the Helm. The skull face was a little far back, but I figured that that would work out just fine. I kept trudging forward, drilling holes into heads and cutting off faces. The third one, I managed to get perfect. Damn it. That meant that I had to go back and do the rest of them correctly. Ah well, the price of a coherent unit! Once I got the heads drilled out, I had to build necks. I’d completely missed that neither the faces nor the helms contained them after I was done chopping them apart. The necks took some doing, but with proper green stuff blobs, they lifted the heads so that they weren’t sunk into the chests. With all the heads mounted on the bodies, I did the easy part next: Shields. I clipped off the spike that held on the bane knight original shield, and slapped on the Spartan lambda shields. Done! this next part was the second trickiest because I’d only done it once on a much larger centurion warjack. 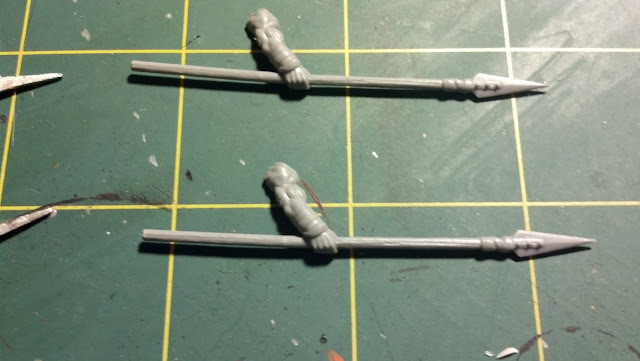 I clipped the bane lances off the hands and gingerly drilled through the hands to be able to line up the spear shafts that I had clipped off the Ungor hands. Once I’d gotten the spear arms ready, it was all over but the posing! I only got the first set of heads, which allowed me to get the 6 members of the minimum unit finished. Once I get the rest of the spears and heads, I’ll be on track for my Bane Spartans! Oh, and of course, I have to do nice bases on them, so I just had a friend order the Forgotten Empires bases from Dragonforge. because dead spartans of a forgotten empire make only the most perfect of sense. I’ve made my way through that trials that were the faction Campaigns, and have emerged stronger for it. This trial is not for the faint of heart. Stronghold was, as I said in the other article, one of the more fun campaigns, and thankfully it didn’t let up at any point. The first three maps lead smoothly to the fourth, which has a unique end game that forces you to play the game just a little different, changing up how the game ended. The Stronghold units were balanced enough that I didn’t find the faction skewed towards might or magic heroes. The campaign rewards strongly favor might heroes though, giving me gauntlets, armor and weapons that were restricted to might only, thus diminishing some of the enjoyment I got out of completing certain quests. The Faction play style was refreshing even for someone who has trudged through the 16+ maps to get here. The faction has a TON of melee capacity, even before you factor in the heroes skills and powers, which no other faction really capitalizes on. Inferno and Haven, the other two melee factions, approach melee with different styles, and I really think that Stronghold strikes the concept dead on the head for this game. The key to good melee is alpha striking, no retaliation attacks and Stronghold units delivers in spades. Unlike the rest of the factions, the game play of Stronghold revolves around using all of your creatures. The core units are goblins, harpies and orcs, the elites are centaurs, orc shamans and Aztec themed ogres, and the champions are cyclopes. Whats unique about this set of units is that they are pretty bland before they are upgraded, but once upgraded, are perfectly built to execute the strongholds best tactic: axe to face. Goblins and centaurs are ranged units, able to do a ton of damage with out retaliation, and the centaurs ability to take a free shot at the first enemy to close the distance with my army gave another retaliation-less attack. harpies, when upgraded to furies, attacked without retaliation. Jaguar Warriors, the ogres, when upgraded had a retaliationless charge attack that struck everyone adjacent when he ended his move. Orcs got a second, free, attack after the first and the retaliation that results from it, but did enough damage that I just often used them to finish off stacks. My favorites, however, were the Dreamwalkers and the Cyclopes. Dreamwalkers have the ability to curse units so that they take damage if they act, and the upgrade makes it affect the whole enemy army. With a magic hero like mine the effect was devastating and would be the first troop I upgraded to get the greatest output from them. The cyclops is definitely my second favorite champion unit behind the fate weaver. The basic unit is a melee beater,which works out alright, but the upgrade gives the damn beast magic laser-eyes. This attack does immense damage, has no range modifier, and burns for additional damage over time! It is right up my alley! The whole setup lead to an extremely enjoyable campaign and a great bookend to the single player faction campaigns. I recommend doing them in order: Necropolis, Haven, Sanctuary, Inferno, Stronghold. It creates a flow that, while frustrating, starts strong, wanes in the middle, and finishes with oomph. I’ve finally moved on to the final map(s). The game has two endings depending on what type of character you played, and with me playing both, I’ve got them each to play through. However, with XCOM: Enemy within snapping at my brain, I’ll probably just play the one. Over the past few weeks, I have had my interest in fleshing out the RPG world I’ve created rekindled. Its been what I think about in my spare time, which generally consists of time between holding my baby, and the ride to and from work. Well, one of the concepts that I have always known about my world is that there are tribes of barbarians with totem animals on the fringe of the main country of the island, Tyrndall (tear’n’doll). These barbarians, I’d always thought, would ride their totem animals into combat, and probably have lycanthropic leaders. I was going to put up this write-up about Wild West Exodus on Thursday, but a friend of mine convinced me that the Goreshade and Bane Cavalry one was better timed. Thankfully he did that because I found something today that makes this post a lot easier to write, though a little more depressing. behold: The WWX Quickstart Rules. This is the craziest quickstart document I’ve ever encountered. It is 8 pages of insane rules gibberish and tons of exceptions and special rules. Its not quick or a start. My Journey through the WWX landscape is a sad trail. It was the first kickstarter I’d found all on my own, looking for miniatures games too stretch my budget a little farther. I happened across this strange-looking Wild West science-fictiony game. It had some really cool concept art and basic Miniatures. It was alternate earth, which had worked well for Malifaux, and the factions were intriguing. The Warrior Nations, Lead By Sitting Bull. Each had their own take on the world, some more unique than others. the Outlaws were pretty standard, as was the Union. The Warrior Nations were an amalgamation of all the Native American Tribes. The Enlightened, however, threw me off. They are a strange amalgamation of Undead and technology that seemed a little off. Maybe its just the way that it clashes so starkly with the other three factions. Each of those are their own take on something in the world, while Carpathian and the Enlightened are from Left-center. Anyway. I was happy with three of the four, so I moved forward with trying to spread the word. Maybe someone else will get into it with me. I had no such luck. I did get 3 other people to jump in, and I was pretty stoked that maybe I’d get some games in once the rules came out. The models were cool, and I had hope for the game. Geronimo. Add to that Werewolf Sitting Bull, Wereeagle Sky Spirit, a giant Goddamned Elk. All the warrior nations to that point were a ton of fun, and As each new model was unlocked, more cool things showed up, including the new factions: Confederacy, Lawmen, El Ejercito Dorado, and Holy Order, Heavy support, Cavalry/Light support. Tons of cool looking models and neat ideas. But, for every four good ideas, they had a terrible Idea. A giant $100 train that is not a model in the game, but has some part in scenarios, Mercenaries inspired by Firefly, Ladies models that cater to lonely men, and Weapon carts pushed around by bulky Indians. The biggest problem I had, though, was the structure of the Pledge levels. It seemed designed to make you pledge much more than you’d like just to get what you wanted. Its different from the structure you normally see, the entices you to go bigger. This specific setup gives you more things, but they are generally more things you Don’t want in order to get what you do. there wasn’t a single pledge level that tried to steal you to one full faction, they all added more and more factions. It was… frustrating. So, I was looking forward to the beta test rules to come out, but there was some trepidation: They would only come out once the pledges were finalized and the Kickstarter ended. In retrospect, I’ll not back anything that I can’t see the rules of first. It would have changed a lot of what I have done since then. Because the rules were awful. The beta rules came out with some giant, gaping holes. Stats are difficult to comprehend and read, some abilities made no sense on the models they were on, and balance was completely shot through. It was so easy to tell that this game was built with fun cinematic battles in mind, and that the best way to play would definitely be casual, club or home tables. However, With every pledge came a free ticket to the AZ based Duelcon and entry into their first tournament to be held. They clearly had aspirations to be a balanced, tournament worthy game that held a candle to the big tournaments of other games. However, their scenarios were terrible. I don’t mean bad or sloppy. They were just awful. Deployment and initiative favored one player over the other, and placement of terrain was part of the game. I don’t know if any of you went through the point in minis games where you thought placement of terrain was part of the game, but its terrible. I gave some serious feedback. However, no lie, the responses were overwhelmingly negative. Many people expressed anger at the tournament and balance crowd, while the balance crowd was very frustrated with the “but its fun” crowd. It was among the worst forum experiences I have ever had, and it was very divisive and overwhelmingly negative. The final nail, though, was the final rules set. Very little was changed from the original setup, regardless of discussion or debate, no matter how reasonable. The biggest and most important change, though, was not a change. There was a very specific rule, and I can recall the details fairly clearly. There was a rule that penalized characters that are good in combat for being in combat. Each turn, a model can make as many melee attacks in a Fight Action as their Strikes stat. So,Geronimo, Warrior Nation Boss has a Strikes of 4. He can make 4 melee attacks in a given round. Sounds awesome! However, The rule in question reduced the amount of strikes he could make in combat by the amount of people he was in melee with -1, to a minimum of 1. This rule absurdly penalizes characters who have the sole purpose of being in melee, for being in melee, while also not penalizing characters who are bad at melee. This was discussed very vehemently, and almost the whole of the community thought it was lame and made no sense. Outlaw miniatures response was overwhelmingly terrible: They put a call out in the next set of rules specifically stating why this rule was not terrible. No one was convinced and it was, by far, the strongest reason for me abandoning the game forum and escaping to a miniatures games that seemed good. Fortunatly, the Outnumbered rule does not seem to be on the quickstart rules. This is a start in the correct direction. However, for every move forward they seem to move another step back. Armor: -When a model is hit, it must make an Armor Roll. Roll a D10 and add the target’s Armor Stat to the roll. Then subtract from this total the Power of the weapon. A negative result means that your Armor has failed to stop the attack and the model has suffered Damage. Mark one Lifeblood box on the target’s card for each point of Damage suffered. When a model has its last remaining Lifeblood box marked, it is removed from the table as a casualty. 3 Lifeblood damage from the hit. This is insanely ridiculous. Negative number are confusing and foreign to the way a game should be. especially because the solution is so easy: Power -(Arm + roll) = Damage, expressed as a positive number. Example one can be so simply rewritten. The only words I changed were in bold. The final issue I am going to go into here is that bonuses and penalties are expressed in relation to the stat referenced. Because the stats are better when they are lower, (you want to roll over the number listed) the bonus and penalties are reversed. a +1 is bad, and a -1 is good. This could have easily been changed to be shown as a penalty or bonus to the roll itself, to better align the game with player expectations. Its complex for complexities sake, and really could have been done better, cleaner, and been a great game. There are tons more stories about rules that were dumb or weird or didn’t make any sense, but I’ll let you imagine what was going on. I’m pretty sure that the middle snippet is of a werecat of some sort, and to me, it struck my excitement level back up to 11. I could have a werecat leading my Warrior nation army around. There could only be glory! But then, a day later, I found the link to the quickstart rules, and all hope was lost, again. I’ll get a review of the models once I get them all in, and Hopefully I can send some of them off to someone who will really enjoy the game, while I paint up a cool set of Warrior Nation models to sit on a shelf somewhere. This is the longest post I’ve written, and I’m sad that its negative. Thanks for Hanging in there! Banes for the Bane God! 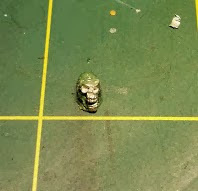 It has been a hard year for Cryx players. The best caster in the game, Asphyxious II, has been justifiably nerfed twice. Though its needed, it does not sting any less. Adding on top o that, we’ve not seen a new release in probably 12 months. I know: Hard is relative. However, we are starting to get some cool information coming through about what we will be in Vengance. Its been a trickle, but I’ll take it, and its hopefully going to come faster as Vengeance nears. Earlier this year I signed up for Project Orange Crush Hunger. The concept is for the community to volunteer to paint models of a given army in an orange theme of each painters choice, and then once the army is finished, its raffled off. The proceeds of the raffle go to hunger relief in conjunction with the years Foodmachine efforts. This, the third year, they’ve chosen to do an orange Convergence army.